There are a number of financial instruments used in business transactions every day. These financial instruments help in making easy the dealing of money and funds between two or more parties. One very commonly used financial instrument is the promissory note. The promissory note is essentially a promise in the written form by a party to pay a specific sum of money to another party on demand or at a specified date and time. This note consists of all the terms and conditions that are related to the obligation of the issuer or creator of the note towards the other party. It may contain things like amount to be paid, interest rate if any, date of maturity, date, and place of being issued and signature of the issuing party. As it is in written form there is a specified format for the promissory note. This format can be taken from an already developed template. 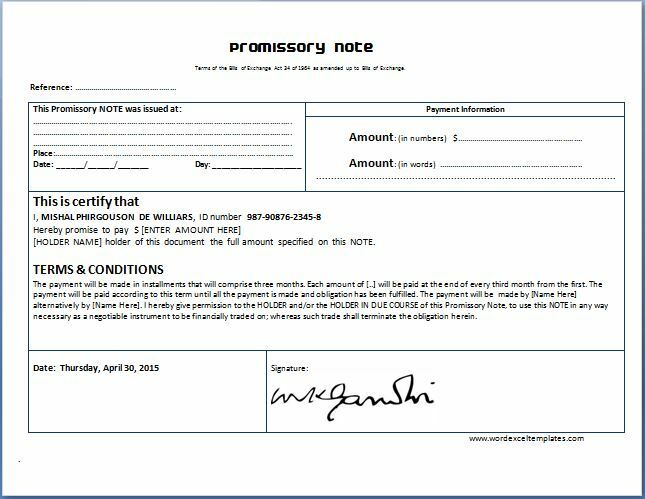 The promissory note template is one such template that is available for download on the internet. It is a comprehensive document that lets you create your own promissory note and add your own terms and conditions. The basic benefit of designing and creating a promissory note is that it allows and facilitates the sale transactions and entering into various types of business contracts with other stakeholders. The template is simple and easy to use and can help understand all the various aspects of the very common financial instrument. Next time you want to create a promissory not just log on and download this unique template and save your precious time.